Time turns out to be an essential component of unschooling—and not just in the ways we first suspect. When we begin unschooling, we often choose it in juxtaposition to school. Maybe we don’t like the systematization of knowledge and how it breaks the very real connections that exist between subjects in the real world. Maybe we don’t like the classroom setup and its heavy reliance on one learning style, competition, and extrinsic motivation. Maybe we don’t like the bland socialization, how it groups same-age children by virtue of geographic proximity and then leaves them to fend for themselves. We’re choosing something different, for sure. But chances are, we’re still wrapped up in the conventional messages around time. Around productivity and busyness and “having something to show” for time spent. We’re going to take that “school time” and replace it with “unschooling time” and we’re good to go. Soon, we discover it’s not that simple. The nature of time through the conventional school lens—which has become society’s lens—is that learning marches along in measured steps: fact by fact, skill by skill, day by day. It doesn’t take long watching children who are free to learn to see that that’s just not true. Genuine, engaged learning cannot be usefully measured by time. It comes in fits and starts. In big jumps of revelation and baby steps of determined understanding. And we start to suspect that those big stretches of time they spend seemingly “doing nothing of value” are playing an important role too. Our concept of time begins to unravel as its true nature reveals itself. Over the last two stages, you’ve confronted a lot of conventional wisdom around learning and parenting. You’ve worked to replace school and curriculum-based learning with learning through living—helping your children follow their curiosity and engage in their interests and passions. You’ve also taken great strides in replacing control with connection in your relationships with your children, taking each moment as it comes and working together to find a path forward that meshes reasonably well with everyone involved. And you’ve started to see some of the beautiful ways in which these truths play out with your children. I bet there have been moments when you were amazed by their insight and choices! And times when you played with your discomfort to learn more about it. Your trust in the process of unschooling is growing as you add your personal experience to the mix, stirring it in with your initial intellectual understanding. And you’ve gained some well-earned confidence through navigating the twists and turns of the journey so far. You can think of your deschooling story to this point as working through much of the nuts and bolts of unschooling, the hands-on details of living unschooling day-to-day. You see your children actively learning without curriculum or formal instruction, following their curiosity and flowing from one activity to the next, sometimes quickly, sometimes spending an extended amount of time focused on one thing in particular. Saying yes comes more easily to you. As does taking the time to solicit your children’s perspectives, bringing their needs and wishes more thoughtfully into the conversation. Campbell calls this stage of our story “The Meeting with the Goddess.” In myths and stories, the hero must be spiritually prepared to meet this revered goddess, the Universal Mother, who represents the whole cycle of life. If not yet ready, the hero is only able to see aspects of her. To meet her in her true form is to rise to her challenge and be able to contemplate the entire birth–death cycle she represents with equanimity. The ups and downs. The good and the bad. Cosmic creation and destruction. To be able to hold both these seemingly opposing ideas in your mind with comparable appreciation. Kali, from Hindu mythology, is a great example of the kind of goddess you meet in this stage. As the goddess of time, creation, and destruction, she represents both the benevolence of a caring, comforting mother and the fury of an aggressive, punishing one, as well as the expanse of time that contains them both. You’ve probably heard the adage, “Change is the only constant in life.” Well, Kali’s four arms represent the rhythm of this change: creation and destruction, birth and death, good and bad. Typically, her two left hands hold a bloody sword and a severed head, while her two right hands depict protection and compassion. When we look at Kali’s right side we see good; when looking at her left, we see bad. If we aren’t yet ready to see her in her true form, we see one side or the other. But when we are ready to grasp the truth that lies at the heart of this stage, we see her full nature. According to Hindu myth, Raktabija, whose name means “the seed of blood,” was a demon who received a boon, or blessing, from Brahma, the creator God, that meant every time a drop of his blood touched the ground, a duplicate of himself would be created. Raktabija was a fearsome demon, causing a lot of trouble for both people and gods, but every time the gods tried to vanquish him, the battlefield became littered with his clones. In desperation, the gods approached Shiva, one of the three gods responsible for the creation, upkeep and destruction of the world, but he was deep in meditation, and they were loath to disturb him. They turned to Parvati, his wife, and asked for her help in defeating the demon Raktabija. Having consumed all of Raktabija’s blood, Kali transformed into a destructive force herself, killing anyone who crossed her path and decorating herself with trophies of battle: the heads and limbs of her victims. The gods, frightened and unable to calm her, decided to arouse Shiva from his meditation and asked him to intervene. Shiva found Kali and threw himself at her feet, which eventually calmed her, and she embraced him, shedding her deadly form. 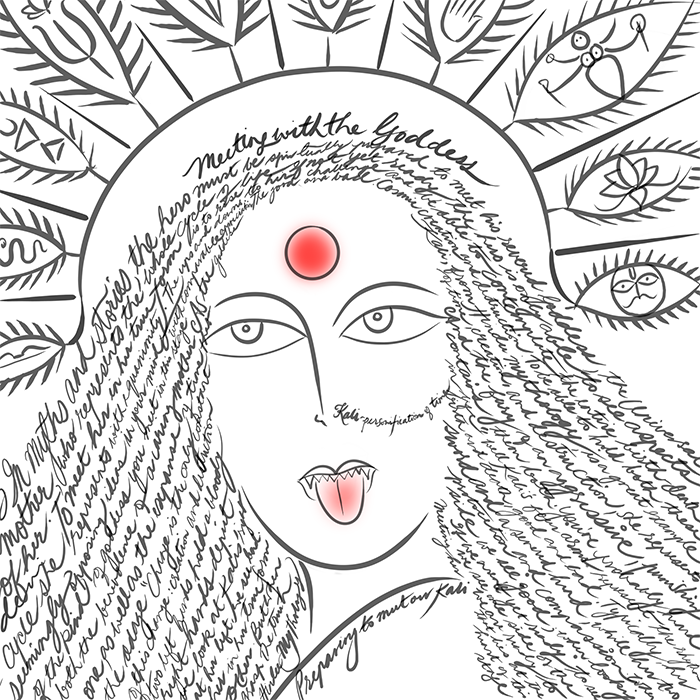 This story is just one of the creation myths that surround Kali. We see how she came into being, with Parvati transforming into Kali to help the gods defeat the demon Raktabija. Seeing a way to outwit the demon’s trick, Kali saves the day by drinking all of his spilled blood so he may be defeated, but, as a result, transforms into a destructive force, killing anyone who crosses her path. Eventually, her husband, Shiva, is able to calm her down and she transforms into a gentler form. In her story, we see the cycle of creation, destruction, and back again, in the fullness of time. In fact, Kali is the feminine word for time in Sanskrit; she is the personification of time in Hindu mythology. It’s a captivating story, but how does it relate to our unschooling journey? All that we’ve learned on our journey so far about the world of unschooling has prepared us for this stage. We’ve been living our unschooling truths about learning and parenting for a while now. We’ve seen them play out in our lives, with our children, and we have some real experience under our belt. As insatiably curious human beings, we continue to ask ourselves why. As we continue to dig into these truths to better understand them, we soon catch a glimpse of what lies beneath. We start to see the connections between our unschooling perspective on why quitting things is not “bad,” and why saying yes more is not “bad,” and why our children seemingly doing nothing is not “bad.” We notice that when we didn’t stop our children because we feared they were making a “bad” choice, most often they went on to happily engage in the activity, see how it played out, and incorporate that experience next time. In other words, we saw them learning. A lot. By giving our days the time to unfold more naturally, we’ve seen new and interesting things take root in the wake of destruction and upset many times. From a fallen block tower springs a taller and sturdier one. From highly anticipated plans falling through emerges a spontaneous trip to the park, or a cuddly movie day, which turns out to be just what was needed. Without knowing it, we have been thoroughly preparing ourselves for this meeting. 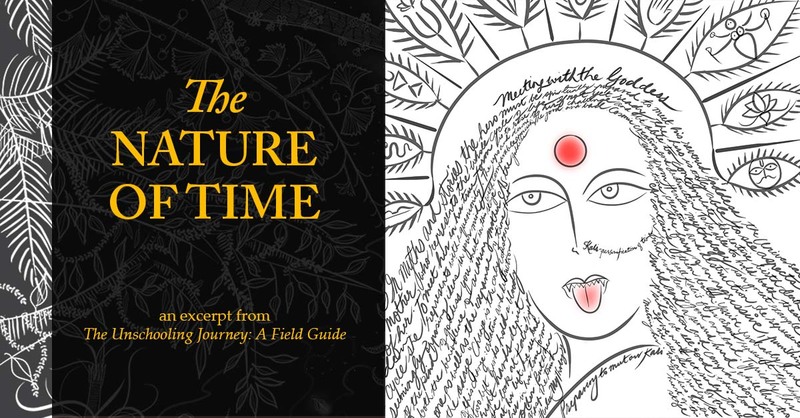 This is an excerpt from my new book The Unschooling Journey: A Field Guide, a weave of myths, contemporary stories, and tales from my journey. 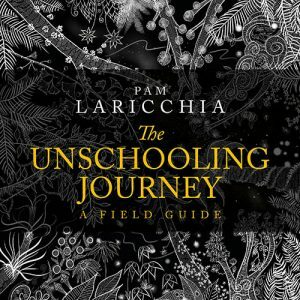 It’s not a “how to” book—no two paths through the world of unschooling have the same twists and turns—yet having a general sense of where you are on your journey can bring valuable insight as you navigate the challenges that will inevitably appear. I share this book as a field guide to the stages and characters you are likely to encounter in some form on your unschooling journey. The print edition (Amazon) is also a journal for you to document your journey alongside. Order your copy now.